The most popular poker games are not always the most profitable ones, as their popularity can lead to people to study them – making them tough to beat. HORSE is a mixed game that combines several poker variants, some of which are not so popular. Most players in a HORSE game or tournament will be proficient in one or two of the games, but have serious deficiencies in the rest of the games. Therefore, becoming a reasonable player in all the variants will be quite profitable. Each variant is played for the number of hands it would take to go around the table if the table were full. A full ring table would thus play nine hands of Texas Hold'em before switching to Omaha hi-lo; a six-max table would play six hands of Razz before switching to Stud, and so on. It's important to stay aware of which game is being played, since playing the wrong game will give you some pretty bad results. In particular, thinking you are playing Razz when you are in fact playing Stud is extremely detrimental, because in Razz you want the low hand while in Stud you want the high hand. During the Hold'em portion of the game, position and starting hand selection will be key. This is the game that the most people know best, and as such you should be playing a solid value range. Outplaying your opponents will usually not be an option since the game will be limit Hold'em, and bluffing will rarely be profitable. By the same token though, you can value bet thinner, often betting three streets with a hand like top pair in heads-up pots. You should tend to be even more value-oriented in multiway pots. If there is a particularly weak player on your right, it is wise to open your ranges up somewhat so as to play more pots against this player. As Hold'em might be their weakest game, you want to take advantage of that as much as possible during the Hold'em rounds. The Omaha strategy in HORSE will be very similar to Hold'em in nature. For many of the Hold'em "specialists," Omaha will be their second best game because it is the most similar to Hold'em. But Hold'em players tend to have common deficiencies in their Omaha game. They will typically over-value weak hands (since hands like two-pair are fairly strong in Texas Hold'em), and may think weaker Omaha draws (like straight draws on a flush draw board) are stronger than they actually are. As in Hold'em, punish these players by playing strong ranges and betting for value, since they will be calling down with weaker hands than they should. Position should again be a key factor in your decision-making process, and you can widen your range substantially from the button. Again, find the weakest Omaha players at the table and try to play more pots against them, in position especially. These players will make the most mistakes and therefore allow us to play the widest profitable ranges. During the Razz portion of a HORSE game, you will usually start to see much weaker play. 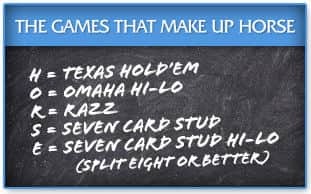 Razz is not as popular as Hold'em or Omaha, and as such, your opponents will tend to have less experience and make bigger, more frequent mistakes. Thus, the most important strategic element of playing the Razz part of a HORSE game is starting hand selection. Play strong starting hands like 32A and other wheel-draw hands, and bet aggressively for value when your think your hand is best. Slow-playing a hand will usually be a mistake because most players will be playing more passively. In certain situations it's fine to "steal" with a weak starting hand if the pot hasn't been raised and you have the lowest door card showing. It's during the Razz rounds that you will sometimes see inexperienced HORSE players get confused about which variant is being played. This is probably only prevalent in online, low buy-in or freeroll tournaments. But occasionally you will notice someone playing a clearly weak Razz hand as if it's the nuts. Exploit them by calling down or raising for value. This mistake does not usually last longer than one hand. Similarly to the Razz rounds, the key to the Stud rounds is in starting hand selection and value betting. Most players will overplay draws and weak one or two pair hands, so exploit them by betting with your strong hands and not bluffing too often. Hand-reading is important in all forms of poker, but in stud it can be made substantially easier because of how many cards are face-up on later streets. Most players won't be getting tricky with their hands, especially in multiway pots. You can usually assume that if an opponent's actions line up with what his up cards look like, then you know roughly what his hand is. This will allow you to value bet more thinly since if you know what your opponent holds, you know with 100% certainty where you stand in comparison. Keep in mind though that even if your opponent has very weak holdings, it still may be correct to check as opposed to bluff. Many weaker players do not like to fold on 5th and 6th street if they've already made it that far. The strategy for split eight or better will be nearly identical in concept to the Stud strategy outlined above. The key difference in split eight or better is that it's a split pot game, with half the pot going to the high hand and half the pot going to the low hand. This makes it absolutely crucial to play hands that have a chance of "scooping" (winning the hi and the lo). These are hands like As2s3s where there is a chance of hitting a flush or straight, and a very good low hand. It's also important to play suited hands that have a chance at making a decent high hand even if they miss the flush draw – so having the ability to hit a straight or a flush is ideal. If anyone at your table is good at split eight or better, it should already be apparent after playing the razz and stud rounds of HORSE. They will have a grasp of relative hand strength, and on average you will see them with better hands at showdown than your weaker opponents. As usual, punish the weaker players with strong starting hands that are likely to become showdown-able, and always pay attention to all the cards that are showing on the board. Weaker opponents may look at your up cards somewhat, but likely won't use the information effectively (like not noticing when one of their outs shows up). In Hold'em and Omaha, position is one of the most important factors in a given hand. Because of this, you should aim to play wider ranges in position than out of position. This way, your card edge can make up for your positional disadvantage when you are out of position, and you can play more pots when you have the positional advantage on your side. Also remember that competent opponents (and even some incompetent ones) will be positionally aware, and they will therefore play wider preflop ranges in position. The will also make looser calldowns postflop when they are in position. Be sure to try to quickly assess who is positionally aware and who is not. The easiest way to find this out will usually be to pay attention to showdowns. Razz, Stud, and eight or better are games of showdown. At a full table, not many pots will be taken down with a bet before the last street, especially in split eight or better, where there are two half-pots to go after. The key to these games then, lies in playing hands that allow you to win at showdown, and throwing away the ones that need a lot of help to win at showdown (the earlier you throw away trouble hands, the less you will lose with them too). You should always expect to take a hand to showdown if you want it to win. A crucial part of understanding when your hand might be able to make it to showdown involves paying attention to all the up cards on the table. A drawing hand that may have been strong is significantly weakened if some of its outs are already showing on the board. Always pay attention to the board for the sake of understanding your chances of making your hand. In most poker games, but perhaps in limit games especially, it is extremely important to bet your strong hands. There is typically no value in slowplaying a hand unless there is no chance your opponent will call, but a chance they will bluff. This is very rare, and can be hard to spot when it comes up, so you'll usually be better off taking the aggressive route and betting your strong hands. Because the amount of money in the pot will be directly correlated to the number of bets and raises put in, you need to push the action along by betting and raising your value hands yourself. Reading someone's hand in any game of poker is a skill. It would be impossible to cover a satisfactory amount of material here, but there are a few key points to remember. Hand-reading is never done in a vacuum. Knowing the type of player you are playing against is absolutely crucial when hand-reading. Understanding how your opponents think will allow you to interpret most of their actions correctly. Categorize your opponents, and then use that knowledge to narrow their ranges when you are in hands against them. Actions that are out of character usually help narrow a range the fastest (such as when a normally passive player bets with the nuts). 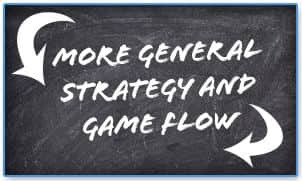 As has been hinted throughout this article, one of the keys to being an effective HORSE player is identifying which players have which weaknesses in which games. The best way to deal with an opponent who is significantly stronger in one of the games is to avoid playing big pots with them in their best game. It's fine to play nutted hands and guaranteed profitable spots against them – but there's no reason to go out of your way to play in pots against someone who is likely to make life difficult for you. Target them in a game where they are not as strong, and minimize your interaction with them when they are in their element. Occasionally (less often in small buy-in games) you will run into a player who is solid in all rounds of HORSE. This player will likely have a strong grasp not just of individual strategies for each game type, but also of poker fundamentals (position, aggression, hand-reading, etc.). This is not a good thing when it happens, but it's also not the end of the world. This type of opponent will usually be thinking on a higher level than your other opponents, and you can expect them to be hand-reading at least a little. Because of this, you are more likely to be able to get away with a (believable) bluff, but remember that they will most likely have some idea of what your ranges are most of the time. Against a strong opponent like this, you should avoid them in your weaker games, and be wary of them in all the games. HORSE is a game that requires a wide skill set to excel in, but with solid poker fundamentals, succeeding in each game is possible. It's the variety inherent in HORSE that allows the strongest players to do so well, since most players will play well in one or two games while playing mediocre at best in the others. This ever-shifting weight of skill is part of what makes HORSE fun for new players looking to expand their poker repertoire. Start your poker education here! Learn to use poker equity to your advantage. Find out what % of hands you should play. Take our tips and improve your game.